For other uses, see Halifax. Downtown Halifax is the city centre of Halifax, Nova Scotia. Located on the eastern-central portion of the Halifax Peninsula, on Halifax Harbour, it serves as the business, entertainment, and tourism hub of the region. Unlike other historic Canadian cities such as Quebec and Montreal or comparably size New England cities such as Portland, Maine, Halifax has not preserved any heritage districts and has few intact blocks of historic buildings, although the downtown is known for the historic architecture of some individual landmark buildings. Demolition and urban renewal in the 1960s and 1970s replaced most of the downtown with blocks with office towers. Granville Mall is a pedestrian mall surrounded by Victorian era buildings. One of the few blocks to have retained its heritage character is Granville Mall, a pedestrian mall formerly part of Granville Street, made up of an array of shops and pubs in a conglomeration of rowed historic buildings built in the 1860s. It is known for the stone facades on each building. Historic Properties, a collection of 19th-century warehouses converted into shops and restaurants, is located nearby. Despite the heritage focus of these remaining blocks of heritage buildings, none are protected as heritage districts. The downtown is home to individual government landmarks such as Province House, built in 1819 and home to the Nova Scotia House of Assembly. Builders such as George Lang created many landmark Victorian Era buildings. Citadel Hill, a 40-acre (160,000 m2) star-shaped fort, is another historic attraction in the downtown. Originally established with the arrival of Edward Cornwallis and the out break of Father Le Loutre's War (1749), the current fort was built in the Victorian Era as the hub of the historic defence system for the port. As a result, there is viewplane legislation that restricts vertical development that might block the direct line of sight from Citadel Hill to the harbour and George's Island in particular. Recent developments have challenged the viewplane limits. The Halifax Public Gardens and Victoria Park bear many Victorian era monuments. Downtown Halifax is the financial centre of Atlantic Canada. Bell Aliant and Emera are headquartered in downtown Halifax. All Big Five Canadian banks have major operations in the CBD. The Bank of Canada also has one of its five Canadian regional offices located in the area. TD Centre on Barrington and George Street. All Big Five Canadian banks have major operations downtown. Major recent commercial developments include the Waterside Centre and the Nova Centre. The latter development will house the new Halifax Convention Centre. Many of the Halifax region's hotels are located in the downtown area, with many major hotel chains maintaining a location here. There are also a considerable number of small hostels nearby. Downtown Halifax is home to Province House, home of the Nova Scotia House of Assembly. Downtown Halifax is the home of the Halifax Regional Council chamber at Halifax City Hall. Offices for the mayor, city councillors, and additional staff can also be found downtown. At the provincial level, the downtown is the home of Nova Scotia's Province House where the Nova Scotia House of Assembly meets. Government House, where the Lieutenant-Governor resides, is located on Barrington Street. The provincial government also has offices in several other downtown office buildings. Canada's federal government also maintains a significant presence in the area, working from various buildings including the Dominion Public Building, the Ralston Building, and previously, the Maritime Centre. Downtown Halifax has hotels, annual festivals and events, an array of attractions, and many restaurants. There are several museums and art galleries in downtown Halifax. Pier 21, an immigrant entry point prominent throughout the 1930s, 40s, and 50s, was opened to the public as a National Historic Site of Canada in 1999. The Maritime Museum of the Atlantic is a maritime museum containing extensive galleries including a large exhibit on the famous Titanic, over 70 small craft and a 200-foot (61 m) steamship CSS Acadia. In summertime the preserved World War II corvette HMCS Sackville operates as a museum ship and Canada's naval memorial. The Art Gallery of Nova Scotia is housed in a 150-year-old building containing over 9,000 works of art. The downtown waterfront area is home to the Halifax Boardwalk. The waterfront in Downtown Halifax is the site of the Halifax Harbourwalk, a 3 km (2 mi) boardwalk popular amongst tourists and locals alike. Many mid-sized ships dock here at one of the many wharves. The harbourwalk is home to a Halifax Transit ferry terminal, hundreds of stores, Historic Properties, several office buildings, the Casino Nova Scotia, and several public squares where buskers perform, most prominently at the annual Halifax International Busker Festival in August. 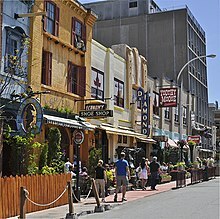 Downtown Halifax, being home to many small shops and vendors, is a major shopping area in the HRM. It is also home to several small malls, including Scotia Square, Barrington Place Shops, and Maritime Mall. Numerous malls on Spring Garden Road are also located nearby. Bars on Argyle Street. Downtown Halifax is home to approximately 200 restaurants and bars. The area is home to approximately 200 restaurants and bars, providing an interesting array of world cuisine. There are also over 60 sidewalk cafes that open in the summer months. The nightlife is made up of bars and small music venues as well as Casino Nova Scotia, a large facility built partially over the water. Neptune Theatre, a 43-year-old establishment located on Argyle Street, is Halifax's largest theatre. It performs an assortment of professionally produced plays year-round. The Shakespeare by the Sea theatre company performs at nearby Point Pleasant Park. Eastern Front Theatre performs at Alderney Landing in Downtown Dartmouth which can easily be accessed from the area via the Halifax Transit ferry service. The Scotiabank Centre is one of the largest buildings in Downtown Halifax, as well as the largest arena in Atlantic Canada. It is the home of the popular Halifax Mooseheads hockey team, and it also plays host to most of the major sporting events and concerts that visit Halifax. The Nova Scotia International Tattoo is held here every year. It is connected to the Downtown Halifax Link, and directly to the World Trade and Convention Centre. 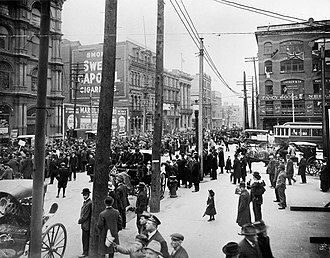 The Atlantic Film Festival, Atlantic Jazz Festival and the Halifax Pop Explosion also take place in some downtown venues. The Halifax Convention Centre, presently under construction, will offer more than 120,000 square feet (11,000 m2) of space for meetings and events. A Halifax Transit ferry heads towards Dartmouth from Downtown Halifax. The waterfront area is home to a Halifax Transit ferry terminal, which takes commuters across Halifax Harbour to terminals at Alderney Landing and Woodside in Dartmouth. These trips usually take around 12 minutes, and cost $2.25 for adults and $1.50 for seniors or children. Additional routes are being planned, and in mid-2005 a high-speed ferry route between the downtown terminal and a new Bedford terminal was demonstrated. The results were generally positive. There are also many tour boats available at the waterfront, ranging from spacious paddleboats to amphibious vehicles such as the locally famous Harbour Hoppers, adapted LARC-V vehicles. The streets in the downtown area are set in a grid pattern like the rest of the Halifax Peninsula, the way the town officials originally planned in the 18th century. Some of these streets have been altered in recent years due to large developments, such as the Scotiabank Centre, which split Albemarle Street into two sections when it was constructed. The street was renamed Market Street and only recently did one segment revert to its original name. City planners in the 1960s developed a controversial plan for a six-lane elevated freeway called Harbour Drive. 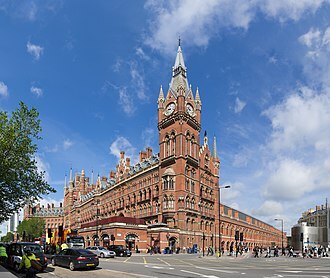 This project was cancelled after protests over the proposed destruction of many historic buildings. All that remains of the project today is the Cogswell Interchange, a massive concrete structure that some consider a barrier between the North End and the downtown area. Its demolition is currently being considered. Traffic problems are currently avoided through the use of one-way streets, and mass transit. Many Halifax Transit bus routes also pass through the downtown, with major terminals at Scotia Square and on Lower Water Street (adjacent to the ferry terminal). Barrington Street is the primary bus route through the area. Spring Garden, a district that is generally considered to be a part of downtown. ^ "History of Heritage Preservation in Portland", Greater Portland Landmarks Archived May 15, 2009, at the Wayback Machine. ^ Downtownhalifax.ns.ca Archived February 21, 2006, at the Wayback Machine. Wikimedia Commons has media related to Downtown Halifax. Halifax Harbour is a large natural harbour on the Atlantic coast of Nova Scotia, located in the Halifax Regional Municipality. The harbour is called Jipugtug by the Mikmaq first nation, anglicized as Chebucto and it runs in a northwest-southeast direction. Based on average vessel speeds, the harbour is located approximately one hours sailing time north of the Great Circle Route between the Eastern Seaboard and Europe. As such, it is the first inbound and last outbound port of call in eastern North America with transcontinental rail connections, the harbour is largely formed by a drowned glacial valley which succumbed to sea level rise since glaciation. The harbour includes the geographic areas, Northwest Arm Another drowned river valley now largely used by pleasure boats. The Narrows A constricted passage to Bedford Basin, Bedford Basin A sheltered bay and the largest part of the harbour. The harbour is home to small islands. The harbour limit is formed by the northern end of its largest island - McNabs Island. The largest island entirely within the limits is Georges Island. Several small islands are located in the Bedford Basin near Bedford, in the Northwest Arm, there is a small peninsula known as Deadmans Island, named for the burial location of War of 1812 prisoners of war. Just 200 m west of Deadmans Island is the equally small Melville Island, Melville Island forms the eastern boundary of Melville Cove and is the location of the Armdale Yacht Club. Melville Cove is the name of the adjacent residential community, although outside the defined harbour limits, Lawlor Island and Devils Island are frequently included in descriptions of Halifax Harbour and the surrounding area. The harbour is marked by a network of buoys and lighthouses, starting with Sambro Island Lighthouse at the harbour approaches. Deep draught vessels must use the channel into the harbour. The west entrance point marking the beginning of the approach using this channel is located near Chebucto Head. Shallow draught vessels may use the Eastern Passage, which runs on the east side of McNabs Island, large vessels have compulsory pilotage, with harbour pilots boarding at the pilot station off Chebucto Head. Marriott International, Inc. is an American multinational diversified hospitality company that manages and franchises a broad portfolio of hotels and related lodging facilities. Founded by J. Willard Marriott, the company is now led by his son, Executive Chairman Bill Marriott and President and Chief Executive Officer Arne Sorenson. Marriott was founded by John Willard Marriott in 1927 when he and his wife, Alice Sheets Marriott, opened a beer stand in Washington. As a Mormon missionary in the summers in Washington, D. C. The Marriotts expanded their enterprise into a chain of restaurants and they opened their first hotel, the Twin Bridges Marriott Motor Hotel, in Arlington, Virginia, in 1957. Their son, J. W. Marriott, Jr. led the company to spectacular worldwide growth during his more than 50-year career, in March 2012, at age 80, he turned the CEO responsibilities over to Arne Sorenson, while he assumed the title of Executive Chairman. Marriott International was formed in 1993 when Marriott Corporation split into two companies, Marriott International and Host Marriott Corporation, in 1995, Marriott was the first hotel company worldwide to offer guests the option to book reservations online, via the companys implementation of MARSHA. In April 1995, Marriott International acquired a 49% interest in Ritz-Carlton Hotel Company LLC, the cost to Marriott was estimated to have be about $200 million in cash and assumed debt. There were other benefits for Ritz-Carlton flowing from its relationship with Marriott, such as being able to take advantage of the parent companys reservation system, the partnership was solidified in 1998 when Marriott acquired a majority ownership of The Ritz-Carlton. Today, there are 81 Ritz-Carlton properties around the world, the Marriott World Trade Center was destroyed during the September 11,2001 attacks. The changes were completed in 2003, Marriott International owned Ramada International Hotels & Resorts until its sale on September 15,2004 to Cendant. On July 19,2006, Marriott announced that all lodging buildings it operated in the United States, the new policy includes all guest rooms, lounges, meeting rooms, public space and employee work areas. There were bombings at the Islamabad Marriott in 2008 and at the Jakarta Marriott in 2009, on November 11,2010, Marriott announced plans to add over 600 hotel properties by 2015. Nova Scotia is one of Canadas three Maritime provinces, and one of the four provinces which form Atlantic Canada. Nova Scotia is Canadas second-smallest province, with an area of 55,284 square kilometres, including Cape Breton, as of 2016, the population was 923,598. Nova Scotia is the second most-densely populated province in Canada with 17.4 inhabitants per square kilometre, Nova Scotia means New Scotland in Latin and is the recognized English language name for the province. In Scottish Gaelic, the province is called Alba Nuadh, which simply means New Scotland. Nova Scotia is Canadas second-smallest province in area after Prince Edward Island, the provinces mainland is the Nova Scotia peninsula surrounded by the Atlantic Ocean, including numerous bays and estuaries. Nowhere in Nova Scotia is more than 67 km from the ocean, Nova Scotia has many ancient fossil-bearing rock formations. These formations are rich on the Bay of Fundys shores. Blue Beach near Hantsport, Joggins Fossil Cliffs, on the Bay of Fundys shores, has yielded an abundance of Carboniferous age fossils, wassons Bluff, near the town of Parrsboro, has yielded both Triassic and Jurassic age fossils. Nova Scotia lies in the mid-temperate zone, since the province is almost surrounded by the sea, the climate is closer to maritime than to continental climate. The winter and summer temperature extremes of the climate are moderated by the ocean. However, winters are cold enough to be classified as continental – still being nearer the freezing point than inland areas to the west. The Nova Scotia climate is in ways similar to the central Baltic Sea coast in Northern Europe. This is in spite of Nova Scotia being some fifteen parallels south, areas not on the Atlantic coast experience warmer summers more typical of inland areas, and winter lows a little colder. The province includes regions of the Mikmaq nation of Mikmaki, the Mikmaq people inhabited Nova Scotia at the time the first European colonists arrived. In 1605, French colonists established the first permanent European settlement in the future Canada at Port Royal, the British conquest of Acadia took place in 1710. The Treaty of Utrecht in 1713 formally recognized this and returned Cape Breton Island to the French, present-day New Brunswick still formed a part of the French colony of Acadia. The Halifax Peninsula is a community and planning area located in the urban core of municipal Halifax, Nova Scotia. 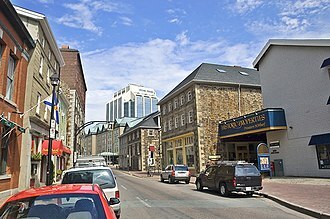 Halifax Peninsula is home to Downtown Halifax, the financial and economic heart of the municipality, the town of Halifax was founded by the British government under the direction of the Board of Trade and Plantations under the command of Governor Edward Cornwallis in 1749. Geographically, the Halifax Peninsula is a Canadian peninsula in central Nova Scotia, although now located entirely within HRM, the peninsula was the original host to the town and now former City of Halifax. 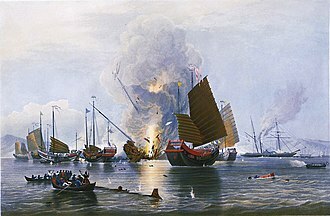 The founding of the town sparked Father Le Loutres War, the original settlement was clustered in the southeastern part of the peninsula along The Narrows, between a series of forts and the harbour. 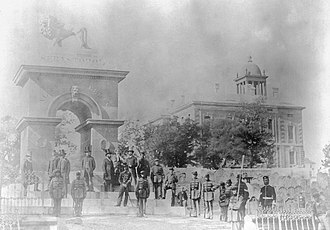 After a protracted struggle between residents and the Executive Council, the city was incorporated to in 1841, at this time the Halifax Public Gardens and Victoria Park, Halifax were created, with many Victorian Era monuments. 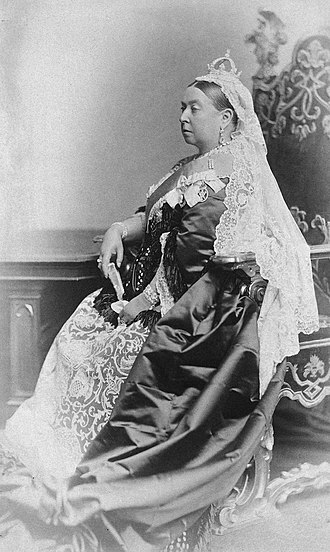 The Victorian era was the period of Queen Victorias reign, from 20 June 1837 until her death on 22 January 1901. It was a period of peace, refined sensibilities. Some scholars date the beginning of the period in terms of sensibilities, the era followed the Georgian period and preceded the Edwardian period. The half of the Victorian age roughly coincided with the first part of the Belle Époque era of continental Europe, culturally there was a transition away from the rationalism of the Georgian period and toward romanticism and mysticism with regard to religion, social values, and arts. The end of the saw the Boer War. Domestically, the agenda was increasingly liberal with a number of shifts in the direction of political reform, industrial reform. Two especially important figures in period of British history are the prime ministers Benjamin Disraeli and William Gladstone. Disraeli, favoured by the queen, was a gregarious Conservative and his rival Gladstone, a Liberal distrusted by the Queen, served more terms and oversaw much of the overall legislative development of the era. The population of England and Wales almost doubled from 16.8 million in 1851 to 30.5 million in 1901, Scotlands population rose rapidly, from 2.8 million in 1851 to 4.4 million in 1901. However, Irelands population decreased sharply, from 8.2 million in 1841 to less than 4.5 million in 1901, mostly due to the Great Famine. Between 1837 and 1901 about 15 million emigrants departed the UK permanently, in search of a life in the United States, South Africa, New Zealand, Australia. 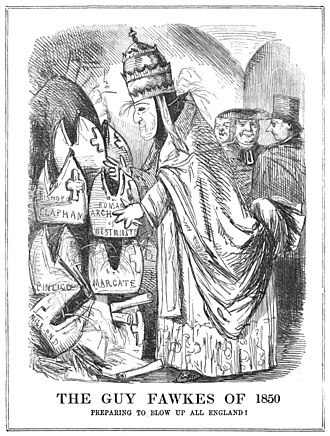 During the early part of the era, politics in the House of Commons involved battles between the two parties, the Whigs/Liberals and the Conservatives. These parties were led by such prominent statesmen as Lord Melbourne, Sir Robert Peel, Lord Derby, Lord Palmerston, Disraeli, Victoria became queen in 1837 at age 18. Her long reign until 1901 was mainly a time of peace, Britain reached the zenith of its economic, political and cultural power. 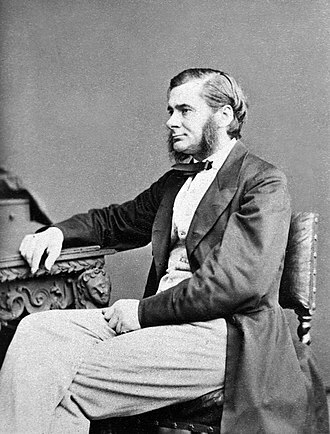 The era saw the expansion of the second British Empire, Historians have characterised the mid-Victorian era as Britains Golden Years. Georges Island is a glacial drumlin and the largest island entirely within the harbour limits of Halifax Harbour located in Nova Scotias Halifax Regional Municipality. The Island is the location of Fort Charlotte - named after King Georges wife Charlotte, Fort Charlotte was built during Father Le Loutres War, a year after Citadel Hill. The island is now a National Historic Site of Canada, many other islands in Nova Scotia and New England were named after various King Georges or other Georges. Unlike those in the US, those in Canada have as a rule kept that name, the island was originally named île à la Raquette which means Snowshoe Island. For a brief time, the Island was known as île dEnville, in 1749, the island was named George Island after King George II, and finally, in 1963, it was renamed Georges Island. Upon the arrival of Edward Cornwallis and the outbreak of Father Le Loutres War, fortifications were established on Citadel Hill, during the Seven Years War, two thousand French sailors were imprisoned on the island after the British victory in the Battle off Cape Race, Newfoundland. During the war, Fort Charlotte was one of four forts where Acadians were imprisoned over the nine years of the Expulsion of the Acadians. The Acadian prisoners in the vicinity of Halifax were subject to various degrees of confinement and dependence upon victualization, without the right to own land, from 1759 to 1768. According to historian Ronnie Gilles-LeBlanc there were approximately 1660 Acadians held prisoner on the island during the deportation, many Acadian men in the region were occupied with road building, wharf building, and wood cutting, and lodged close to where they worked. During the American Revolution the 84th Regiment of Foot were stationed at the fort to protect the harbour from American Privateers. Georges Island was part of the Halifax Defence Complex from the century to the Second World War, with Citadel Hill. For nearly two hundred years Georges Island was the scene of constant military activity, tales of executions and hidden tunnels surround the folklore associated with the mysterious island. Canada is a country in the northern half of North America. Canadas border with the United States is the worlds longest binational land border, the majority of the country has a cold or severely cold winter climate, but southerly areas are warm in summer. Canada is sparsely populated, the majority of its territory being dominated by forest and tundra. It is highly urbanized with 82 per cent of the 35.15 million people concentrated in large and medium-sized cities, One third of the population lives in the three largest cities, Toronto and Vancouver. Its capital is Ottawa, and other urban areas include Calgary, Quebec City, Winnipeg. Various aboriginal peoples had inhabited what is now Canada for thousands of years prior to European colonization. Pursuant to the British North America Act, on July 1,1867, the colonies of Canada, New Brunswick and this began an accretion of provinces and territories to the mostly self-governing Dominion to the present ten provinces and three territories forming modern Canada. With the Constitution Act 1982, Canada took over authority, removing the last remaining ties of legal dependence on the Parliament of the United Kingdom. Canada is a parliamentary democracy and a constitutional monarchy, with Queen Elizabeth II being the head of state. The country is officially bilingual at the federal level and it is one of the worlds most ethnically diverse and multicultural nations, the product of large-scale immigration from many other countries. Its advanced economy is the eleventh largest in the world, relying chiefly upon its abundant natural resources, Canadas long and complex relationship with the United States has had a significant impact on its economy and culture. Canada is a country and has the tenth highest nominal per capita income globally as well as the ninth highest ranking in the Human Development Index. It ranks among the highest in international measurements of government transparency, civil liberties, quality of life, economic freedom, Canada is an influential nation in the world, primarily due to its inclusive values, years of prosperity and stability, stable economy, and efficient military. Pedestrian zones are areas of a city or town reserved for pedestrian-only use and in which most or all automobile traffic may be prohibited. Converting a street or an area to use is called pedestrianisation. However, pedestrianisation can sometimes lead to reductions in business activity, property devaluation, in some cases traffic in surrounding areas may increase, due to displacement rather than substitution of car traffic. Pedestrian zones have a variety of approaches to human-powered vehicles such as bicycles, inline skates, skateboards. Some have a ban on anything with wheels, others ban certain categories, others segregate the human-powered wheels from foot traffic. Many Middle Eastern kasbahs have no wheeled traffic, but use donkey-driven or hand-driven carts for freight transport, the idea of separating pedestrians from wheeled traffic is an old one, dating back at least to the Renaissance. However, the earliest modern implementation of the idea in cities seems to date from about 1800, separated shopping arcades were constructed throughout Europe in the 19th century, precursors of modern shopping malls. The first pedestrianisation of an existing street seems to have taken place around 1929 in Essen and this was in a very narrow shopping street that could not accommodate both vehicular and pedestrian traffic. Two other German cities followed this model in the early 1930s, by 1955 twenty-one German cities had closed at least one street to traffic, although only four were true pedestrian streets, designed for the purpose. At this time pedestrianisation was not seen as a traffic restraint policy, pedestrianisation was common in the United States during the 1950s and 60s as downtown businesses attempted to compete with new suburban shopping malls. However, most of these initiatives were not successful in the long term, a car-free zone is different from a typical pedestrian zone, in that it implies a development largely predicated on modes of transport other than the car. A pedestrian zone may be more limited in scope, for example a single square or street being for pedestrians. A number of towns and cities in Europe have never allowed motor vehicles, archetypal examples are, which occupies many islands in a lagoon, divided by and accessed from canals. A hotel is an establishment that provides paid lodging on a short-term basis. Small, lower-priced hotels may offer only the most basic guest services and facilities, Hotel rooms are usually numbered to allow guests to identify their room. Some boutique, high-end hotels have custom decorated rooms, some hotels offer meals as part of a room and board arrangement. In the United Kingdom, a hotel is required by law to serve food, in Japan, capsule hotels provide a tiny room suitable only for sleeping and shared bathroom facilities. The precursor to the hotel was the inn of medieval Europe. For a period of about 200 years from the mid-17th century, inns began to cater to richer clients in the mid-18th century. One of the first hotels in a sense was opened in Exeter in 1768. 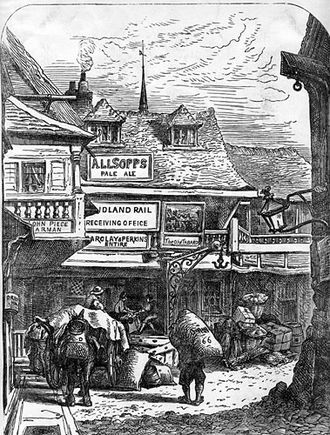 Hotels proliferated throughout Western Europe and North America in the early 19th century, Hotel operations vary in size and cost. Most hotels and major hospitality companies have set standards to classify hotel types. Full service hotels often contain upscale full-service facilities with a number of full service accommodations, an on-site full service restaurant. The RBC Waterside Centre is a commercial development in Halifax, Nova Scotia, Canada built by local real estate developer Armour Group. The original six buildings occupy a block facing the Halifax waterfront bounded by Upper Water Street, Duke Street, Hollis Street. It includes the oldest storefront in Halifax and the site of the famous 18th-century tavern “The Great Pontack”, the buildings have housed commercial and retail tenants, but Armour group has said that the buildings are no longer economical and their replacements by facades should be seen as restoration. The proposed development has split municipal politicians in Halifax and those opposed, such as the Heritage Trust of Nova Scotia, say that Halifax is losing its small and dwindling number of heritage buildings which are a resource for culture and tourism. Supporters like the Downtown Halifax Business Commission say that developers should be given a free rein to promote economic activity, the debate led Nova Scotia’s Conservative Premier Rodney MacDonald to intervene in the citys politics in support of the development and demolition. The Westin Nova Scotian is a Canadian hotel located in Halifax, Nova Scotia and operated by New Castle Hotels and Resorts. It was built in 1928 by the Canadian National Railway as the Nova Scotian Hotel and after changes of owners. The hotel has been called Halifaxs grande dame and has played host to dignitaries, royalty. 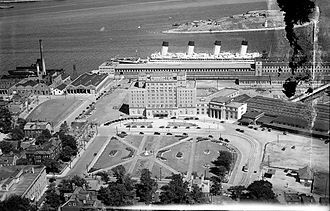 The hotel was built by the Canadian National Railways, construction began in 1928 and it opened on 23 June 1930 as the Nova Scotian Hotel. The hotel was connected by an interior walkway to the Halifax Railway Station. The hotel, like others opened by Canadian National Hotels, was designed by Archibald and Schofield, comprising the Canadian architects John Smith Archibald and it was designed as a complex with the Halifax railway station and the Cornwallis Park across the street. The central axis of the park is aligned with the front entrance of the Nova Scotian, the hotel had 130 rooms and five suites over eight storeys. The Atlantic Ballroom could accommodate up to 275 dinner guests, a new wing was built to the north in 1959, adding 161 more rooms including nine more suites. In 1966, the name was changed to the Hotel Nova Scotian, Elizabeth II, Queen of Canada has stayed in the hotel twice, once in the 1950s and once in the 1970s. Prince Charles and Princess Diana attended a dinner on 15 June 1983 at the Hotel Nova Scotian hosted by Prime Minister Pierre Trudeau. The 700 guests enjoyed a dinner of Canadian wines and cuisine, a crowd of thousands grew outside the hotel hoping to catch a glimpse of the couple before they returned to the HMY Britannia for their departure from Halifax. The hotel was sold by Canadian National Hotels in 1981 when that chain divested all of its properties in the early 1980s and it was purchased by Revenue Hotels and in 1989 Hilton Hotels took over management and the name changed to the Halifax Hilton. Hilton invested $15 million to upgrade the hotel, Revenue Hotels sought to turn the hotel into a casino, but the bid failed. A company was hired to demolish the hotel and it was saved when the property was purchased, in April 1996, by New Castle Hotels and Resorts of Connecticut. 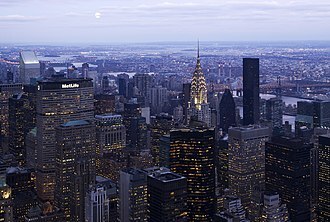 Midtown Manhattan, New York City, is the largest residential and central business district in the United States. 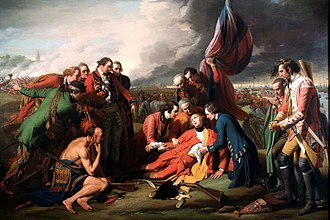 Benjamin West's The Death of General Wolfe (1771) dramatizes James Wolfe's death during the Battle of the Plains of Abraham at Quebec. 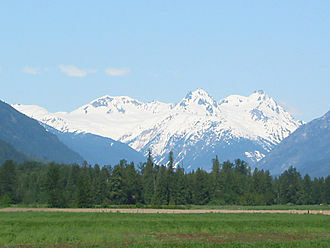 The Mount Meager massif as seen from the east near Pemberton. Summits left to right are Capricorn Mountain, Mount Meager and Plinth Peak. Canadian National Vimy Memorial – For First World War Canadian dead and First World War Canadian missing, presumed dead in France. Fort Edward – the oldest blockhouse in North America (1750). A View of Louisburg in North America, November 11, 1762. Wooden palisade erected along Dartmouth in response to the raid on Dartmouth, opposite side of the harbour from the Great Pontack, during Father Le Loutre's War, 1759. Aftermath of the Halifax Explosion, a maritime disaster that devastated the city in 1917. The coastline of Halifax from Duncan's Cove. The city has a significant length of coastline due to its heavy indentation. Midtown Manhattan in New York City, the largest central business district in the world. Shown is the terraced crown of the Chrysler Building lit at dawn. Central business district of Frankfurt, Germany. From top right, pictures are Town Clock, Hydrostone Shops, HUGA Trail, Saunders Park, and the Halifax Central Library. 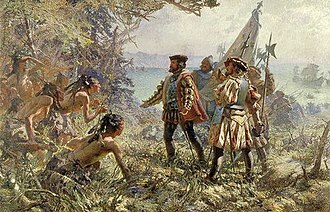 Depiction of Jacques Cartier's meeting with the indigenous people of Stadacona in 1535. British regulars and Canadian militia engage the Continental Army in the streets of the city. 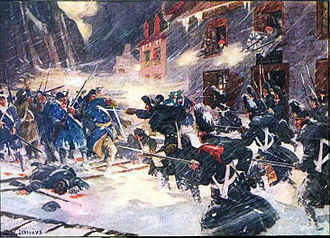 The Americans' failure to take Quebec in 1775 led to the end of their campaign in Canada. 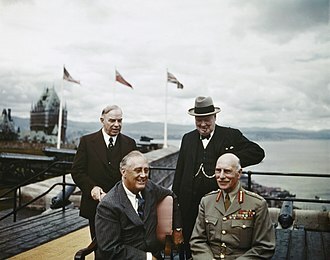 Mackenzie King, Franklin Roosevelt, Winston Churchill, and the Earl of Athlone (left-to-right) at the First Quebec Conference, a secret military conference held in World War II. 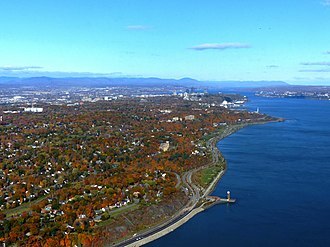 The Promontory of Quebec at the narrowing of the Saint Lawrence River and surrounded by the Laurentian Mountains. 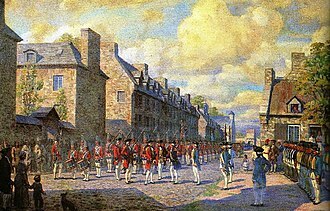 French authorities surrender the city of Montreal to the British after the Articles of Capitulation was signed in 1760. 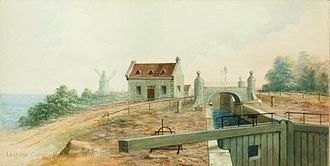 View of Lachine Canal in 1826, a year after it opened. It bypassed the rapids west of the city, linking Montreal with other continental markets. 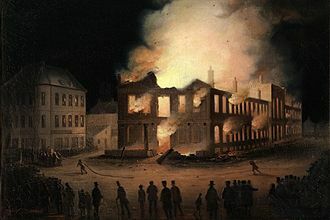 Political protests from Tories led to the burning of the Parliament Buildings in Montreal in 1849. An anti-conscription rally in Montreal, 1917. During both World Wars, the city saw protest against the implementation of conscription. Clockwise: Portland waterfront, the Portland Observatory on Munjoy Hill, the corner of Middle and Exchange Street in the Old Port, Congress Street, the Civil War Memorial in Monument Square, and winter light sculptures in Congress Square Plaza. Site of First Legislative Assembly Plaque, Royal Nova Scotia Historical Society, Scotia Square, Halifax, Nova Scotia. Armour Group's demolition notice for three of the heritage buildings. Hostel dormitory room in Taiwan. The world's first "youth hostel" was established in 1912 at Altena Castle in Germany. The Key Bridge Marriott is the company's longest operating hotel. Halifax City Hall, as seen from Grand Parade. Horsemen on the Grand Parade, 1887. City Council and Department Heads, 1903. Composite photo by Notman Studio. Father Jean-Louis Le Loutre led the Acadian Exodus, an event that saw half of the Acadian population in the Acadian peninsula relocate to French-controlled territories further inland. Fort Edward in 1753. In an effort to further consolidate control, John Gorham was dispatched to establish the blockhouse at Pisiquid. Guided and self-guided tours watch the daily noon-gun firing ceremony. The York Redoubt is a shore battery situated south of Citadel Hill, and a component of the larger Halifax Defence Complex. The Citadel served as the centre of the defence complex. Maritime Centre, Bell Aliant's Halifax office. RMS Olympic docked behind the Nova Scotian in 1931.